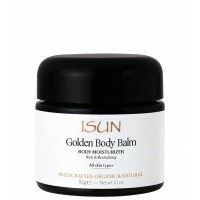 ISUN Soothing Relief Balm contains cooling coconut, cucumber and aloe vera and helps to soothe and moisturise skin with aromatic virgin coconut oil and refreshing cucumber distillate. 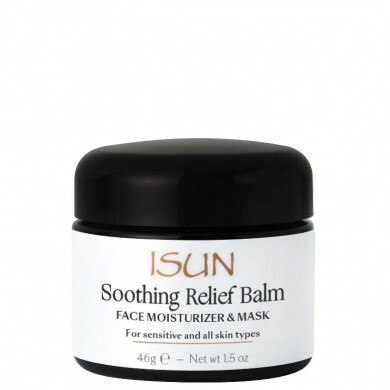 Soothing Relief Balm helps reduce the appearance of redness and supports a look of calm, moist soft radiance. 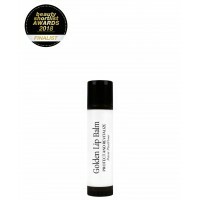 This versatile skin balm may be used as a daily moisturiser, a facial mask or a night balm. Ideal for all skin types, especially beneficial for sensitive skin and hyper-sensitive skin conditions. Excellent for sunburned skin to relieve pain, prevent peeling and promote rapid healing. How to use: Apply Soothing Relief Balm all over cleansed face and neck including eye area, or on other target skin areas and leave on overnight. May also be used as a day and night moisturiser. Blend with 1 pump of Sapphire Oil for a more calming facial moisturiser. Reapply frequently on sunburn or other burns to speed healing of tissues. To relieve stinging and itching from bug bites, plant stings and rashes, reapply on target areas frequently. Take on hikes and outdoor activities to have available as an emergency aid. Natural balm products are vulnerable to heat and may separate, soften or melt with exposure. To avoid melting or separation, keep this product in temperatures below 22˚C and out of sunlight. If exposure to heat causes this product to separate, stir with a clean utensil and place in a cool place overnight to re-solidify. Avoid getting water in this product to prevent contamination. *All ISUN products that you purchase on our website are packed and dispatched directly by ISUN from..
ISUN Soothing Silk Creamy Face & Body Cleanser is based on pure herb-infused aloe vera gel ..
*All ISUN products that you purchase on our website are packed and dispatched directly by ISUN fro..